By 1987, Rice is very much in demand by architects all over the world. His working life is split between Ove Arup & Partners' London office, RFR's Paris office where he spends a day a week, and the Renzo Piano Building Workshop office in Genoa, where he spends a day a fortnight — the Stadio San Nicola project is just getting underway. Rice is a Board-level partner at Arups, overseeing projects and working in competition teams, which also involves a lot of travel. Family life is focused on the same small house in Shepherd's Bush, West London, that he and Sylvia had lived in since the end of the 1960s — a 'two up, two down' terrace house with a three-storey extension. In 2012, friend and colleague Mike Dowd recalled the noisy neighbours they had and how spirited the children were. Rice owned a very non-descript car. In counterpoint to the hectic construction industry life he was leading, the year 1987 also brought him a very different kind of challenge, a collaborative project on which he would continue to work in succeeding years and that appealed to the mystical side of his character. It's a project that continues to intrigue today — La Théâtre de la Pleine Lune or the Full Moon Theatre. The idea is to develop site-specific experimental theatre projects lit solely by reflected moonlight. Rice devotes a chapter in his book, An Engineer Imagines, to this project, providing English-speaking readers with the most information available on it. He describes the project as being about minimal intervention, continuing: "Myth, fantasy and reality combine under the powerful ritual presence of the moon itself". The project's creater, French opera director and architect Humbert Camerlo (b.1943) approached Rice in late 1987 to work with the interdisciplinary research group Ateliers de Gourgoubès, the committee for which included physicists, artists, musicians, writers, choreographers, dancers, TV producers and film directors. 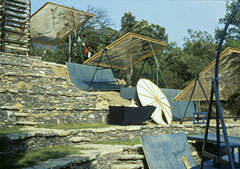 The Full Moon Theatre would be one of their projects, "a symbol of integration between art, science and environment", according to Camerlo. Besides his Arups and RFR workloads, over the next four years, Rice worked on the development of moonlight reflectors that could be constructed on site by local people. 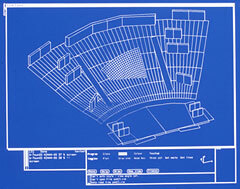 The calculations necessary to track the full moon during performances (in order to keep as much light as possible focused on the stage area) were done by Arups in London, mostly by Andy Sedgwick. They are specific to the initial location of the theatre — remote countryside in the south of France, on former vineyard land belonging to the farmhouse where the Ateliers were based. High tech meets low tech in this project, as the group was trying to build accurate optical devices using readily-available materials. The idea was to experiment with what was possible through gradual improvement and interaction. Rice passionately embraced all aspects, writing that, "The project must remain natural, in tune with the place and its spiritual vibrations. Anything too technological would disturb this balance". 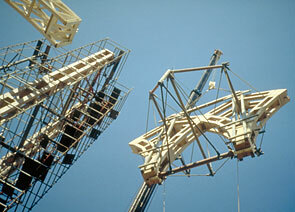 In 1991, construction of the full-size outdoor theatre began and RFR became involved. Grassed seating tiers were built using drystone walling, and a stage area constructed. 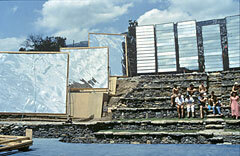 Two types of timber-frame mirrored-plastic reflector designed by Rice were assembled, and a third designed by Camerlo. Various performances have taken place at the site, and at other nearby locations. The project is ongoing, though at the time of writing (2012), it would appear to be dormant. Rice considered the Full Moon Theatre "a project for many lifetimes" and he identified very strongly with it. He imagined people around the world setting up their own theatres, each quite different as each would be "generated by some reservoir of enthusiasm linked at a spiritual level". It's hard not to conclude that at this point in his life it filled some deep need in him. Life was certainly not slowing down on the work front. In 1988, Rice was invited by architect David Mackay (b.1933) of Martorell Bohigas Mackay (MBM) to join the design team for the Pabellón del Futuro (Pavilion of the Future, engineer: Ove Arup & Partners), one of six themed exhibition halls proposed for Expo '92 in Seville. He also began work for Arups on Kansai International Airport terminal building (architect: Renzo Piano Building Workshop), which would have him travelling to Japan once a month. With RFR, he begins work on La Grande Nef at Tête Defense in Paris (1988-90, architect: Jean-Pierre Buffi) and the TGV/RER Station roof, Charles de Gaulle Airport (architects: Paul Andreu, Jean-Marie Duthilleul). That year also saw him receive tangible recognition by the architectural profession. 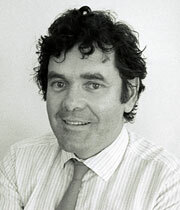 He was made an Honorary Fellow of the Royal Institute of British Architects (RIBA). 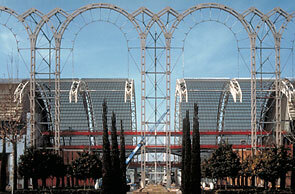 The client for the Expo '92 project, Pabellón del Futuro, wanted a spectacular building. The architects decided on tall structure that would impress visitors, running along the face of the exhibition hall and supporting its waveform roof and canopy. Inspired by an image he had seen a month or so earlier of a freestanding façade wall in an unfinished Portugese historic palace, Rice suggested using stone. Characteristically, he wanted to use modern analytical, fabrication and construction methods to create a minimised structure, despite its enormous size. Stone technology at the time was more advanced in Spain than elsewhere. The façade of 'delicate' arches is 290m long and 40m high, made up of Galician granite pieces just 200mm square. The pieces were precisely cut and assembled into modules, put together on site as you would assemble precast concrete components. The modules were dowelled then glued together with a thin layer of epoxy adhesive (an echo of the use of glue on the Sydney Opera House roof). To achieve the height of the façade and its eleven arches, triangulated steel lattice structures tied to steel masts combine with pairs of minimised stone columns to make composite towers, behaving as cantilevers from the ground. Further steel cable and tie rod systems provide out-of-plane stability above the towers. The stonework is otherwise self-stable, its design based on a geometric solution rather than a resolution of stress and strain forces. Work done with RFR on Les Serres (1982), La Villette, provided some of the technology needed to make the façade possible. The Pavilion of the Future would the be the last major project engineered by Rice to be completed in his lifetime. October 1991 brought the cruel news that Rice had a brain tumour. He was operated on about a week later, and although he continued to work a little, he did so from home in London (until around June 1992). The hectic pace he had kept up had to slow down, and he stopped flying to Japan for Arups on the Kansai project, where he had been attending design sessions and working closely with Renzo Piano (b.1937) once more. He now began work on the book that has largely shaped the way the world at large sees his life and work, An Engineer Imagines, which would be published postumously by Ove Arup & Partners. In June 1992, the family celebrated eldest daughter Julia's wedding — held at the Full Moon Theatre site in the south of France. She married a Paris-Sorbonne professor in an Irish pagan ceremony. The bride and bridegroom's parties each camped in a different field, supposed not to meet until the right moment. A week later, Rice was back in London to receive the RIBA Royal Gold Medal for Architecture, an exceptional honour for an engineer — one that his first inspiration, Ove Arup, had also been awarded. The only other engineer to have been so honoured is Pier Luigi Nervi (1891-1979). The medal is awarded annually in recognition of achievement in the advancement of architecture. Then RIBA President, Richard MacCormac (Richard Cornelius MacCormac, b.1938, later Sir Richard MacCormac) said in his introduction to the award ceremony speeches (as printed in the RIBA Journal) that the "... award to Peter gives us an opportunity to be seen to declare our commitment to the quality and invention about which we care so passionately and which he represents ... To Peter Rice, the advancement of architecture owes so much". Rice's friends and long-time collaborators Piano and Richard Rogers (Richard George Rogers, b.1933, later Baron Rogers of Riverside) — "two men who would have had to invent Rice if he had not existed", as Jonathan Glancey put it in his newspaper report — spoke movingly at the ceremony . Understandably, given the context, the relationship between architecture and engineering was a predominant theme. Rogers states that Rice suggested the topic, and goes on to say that, "In reality the difference is less between professions than between individuals and their abilities. Peter is one of a small handful of truly creative designers". Rogers also gives us an insight into Rice's approach to life and career, "... he is not interested in all the normal trappings that go with success such as public relations, money, a large house, fast cars or even a company carrying his name". In his own speech, Rice attempted to explain what an engineer does. The objective world of the engineer contains elements such as the exploration of materials, "but it also includes understanding observable facts". He describes his current interest in "the difference between real and virtual surfaces; how, as a structural engineer, one can change and destroy a space by introducing a virtual surface into it which is made by the structure ...". Members of the audience that night were well aware that Rice was unwell. Jonathan Glancey commented that, "There can have been few recipients of the Royal Gold Medal for Architecture as popular as Peter Rice. This is not just because he is a modest and very likeable genius, but because the best architects in the world desperately need his massive contribution" (The Independent). Despite his illness, Rice was working on a project that allowed him to explore the possibilities of yet another material — marble. With RFR, Lille local architect Pierre-Louis Charlier and the Bishopric of Lille, he was developing a proposal for the incomplete west front of the city's 19th century cathedral, Notre Dame de la Treille. Included in the team was French artist Ladislas Kijno (b.1921, Warsaw), who was designing the stained glass rose window that would be set into a huge central ogive stone arch in the new wall. Kijno christened the Rice proposal to use thin translucent sheets of marble for the rest of the arch as the 'Veil of Véronique', after the gossamer veil Veronica is supposed to have used to wipe Christ's blood and sweat from his face as he carried his cross to the crucifixion. The proposal for the arch infill (and rose window support) was to use the structual system developed for the sheer glass walls of Les Serres, to join and suspend 28mm thick sheets of marble. This made it possible to eliminate all visible fixings from the face of the marble, as seen from the interior. At this thickness the marble is translucent, creating a magical warm light inside the cathedral. However, Rice was not to see the completion of this project, which wouldn't be inaugurated until 1999. Rice died in London on the 25th October 1992. He was only 57 years old. Similar view at night with moonlight. The reflectors are ranged around the amphiteatre at different heights in order to avoid them shadowing each other. 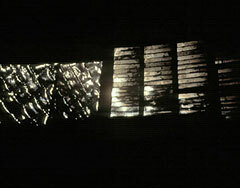 The reflectors are shown turned to the ground — in case they should focus sunlight on the surrounding landscape and cause a fire. Near the centre can be seen the back of the second type of reflector Rice developed, an 'Archimedes' with its circular frame. 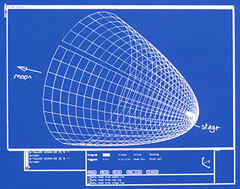 The Full Moon Theatre's Kepler reflectors are segments of a giant theoretical paraboloid, the axis of which runs from the moon to the stage, with the stage as the focus. The reflector panel plywood coverings were cut from templates made in London. The stone façade structure of the Pabellón del Futuro was intended to be erected on site with minimal need for scaffolding. The stone and steel elements of the modular self-stable units, such as the 'capital' shown, were pre-assembled at ground level and craned into place as one piece. 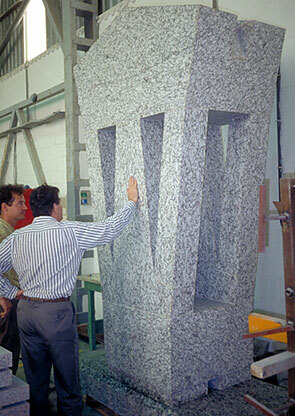 Rice (in the striped shirt) with the prototype of a granite unit for the Seville project, at the stonemason's yard near Vigo, Galicia, Spain. 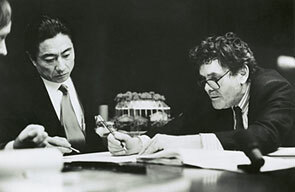 Rice in Tokyo, 1990, at a meeting with Japanese architect Yutaka Saito (b.1947). Lille Cathedral (Notre Dame de la Treille), France. 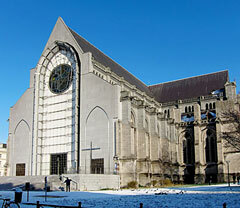 The west front was completed in 1999 based on a proposal by a design team that included Rice and RFR. The cable suspension system structure for the main arch's marble infill panels can be seen on the exterior. 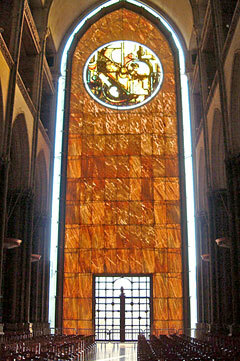 The 'Veil of Véronique', Lille Cathedral. The thin marble sheets, with no visible fixings on the interior, frame the stained glass rose window and cast a magical light on worshippers.